CYPRESS, Calif. – June 8, 2011 – Yamaha Motor Corp., U.S.A., the number one maker of sport ATVs, today announced its 2012 YFZ450R sport model and Raptor 90 youth ATVs. The company also announced an industry-first custom graphics kit option for all 2012 sport ATV models. 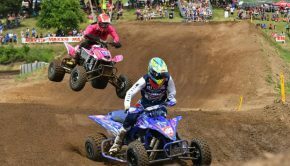 Yamaha’s summer announcement includes two 2012 ATVs: the high-performance YFZ450R sport ATV and the entry-level Raptor 90 youth model. 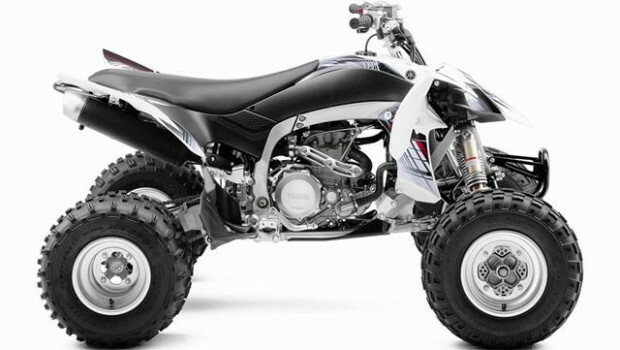 The YFZ450R is a motocross-ready, high-performing sport ATV with long-travel adjustable suspension, a no-weld aluminum with steel hybrid frame, and a powerful fuel-injected engine. At 48.8 inches wide, it is the ideal machine for the track, open trails and desert riding. 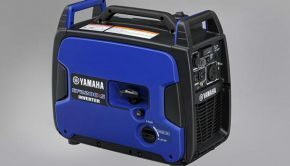 The powerful, high-revving machine has a 5-valve DOHC liquid cooled single cylinder 449cc engine with Yamaha’s electronic fuel injection featuring a 42mm Mikuni® throttle body, 12-hole Denso injector system and a Mitsubishi 32 bit ECU. The 450R’s superior suspension comes from the 44mm KYB shocks in front that have Kashima coating for smooth operation and impact absorption with 9.8 inches of wheel travel. In the back, the gravity-fed cast aluminum swingarm is matched to a fully adjustable 46mm KYB piggyback shock affording the rear wheels 11 inches of travel. Yamaha’s YFZ’s performance not only comes from its power, but its comfort and ergonomics. Its light, hybrid aluminum-steel frame, T-shaped seat, flexible side panels, adjustable ProTaper® handle bars, and custom-designed Dunlop® tires measuring 21 inches in front and 20 in back combine to allow riders to push harder for longer (within their own limits, of course). For the entry-level rider, Yamaha’s 2012 Raptor 90 offers a quality option with true-Raptor family styling and manageable features for younger riders (years 12 and older only, and always with adult supervision) – all at an affordable price. The little Raptor’s 88cc forced air cooled engine is tuned to develop excellent low-to-mid rpm range performance along with a fully automatic CVT transmission. Pushbutton starting and the automatic transmission give beginners an easy-operating advantage in their first riding years. Parents will appreciate the adjustable CDI rev limiter, which allows a supervisor to adjust power output as the rider becomes more experienced. The Raptor 90’s comfortable and roomy design gives riders space to grow on the machine until their skills and age are better matched for the next level. Taking style and functionality from the bigger Raptors, the 90 features a molded front grab bar similar to the Raptor 700R and integrated full floorboards. Its double A-arm front suspension with 4.4 inches of travel and swing arm with 3.3 inches of travel out back also help increase comfort. Both the front and rear suspension set-ups feature five-way pre-load adjustable shocks. 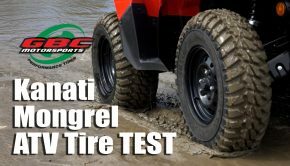 The ATV has a hydraulic disc brake in the rear and dual sealed drum brakes in the front, and it rides on low profile Maxxis tires. 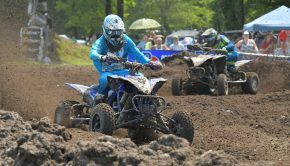 The 2012 YFZ450R and Raptor 90 both come in Team Yamaha Blue/White and the new all-white plastic with black frame and custom graphics kit options.